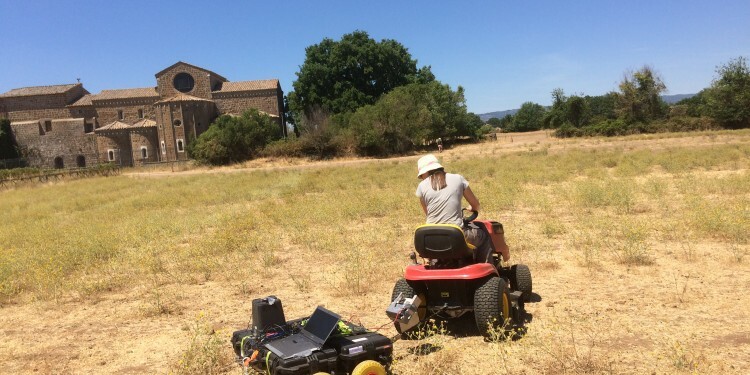 Mobile gamma spectrometry was carried out across the site of Falerii Novi in the month of July. Using two, 20 litre NaI detectors a drive-over survey was conducted across the site to determine the spatial distribution of Cs-137, which is derived from nuclear weapons testing and accidents. When Ca-137 is deposited from the atmosphere, it binds strongly to clay minerals in the topsoils, hence mapping its distribution allows us to map the movement of topsoil across the site of Falerii Novi and to identify areas at risk from water and tillage erosion. In addition a higher resolution survey using detectors mounted close to the ground was carried out across the fields in the northern area of the site. This arrangement optimises the detection of natural geologically derived radionuclides that it is hoped may provide information about the buried archaeological remains.